Tugboat’s Core Package, Workforce Services, automates and simplifies key workforce management functions that are not always provided by standard ERP, HRIS, T & A, and payroll packages. It provides HR and front-line managers with real-time access to information about employee skills management, and their availability, along with employee requests. bidding, for requests of all types, and for reporting. 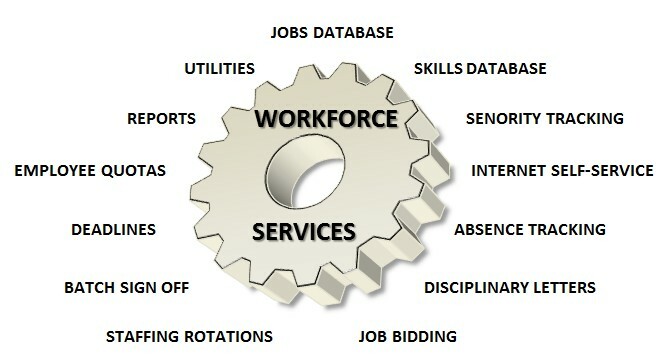 Skills Database – Creates and manages employee skill data including tools for training tracking and strategy. Seniority Tracking – Manages and tracks seniority company-wide and across multiple departments. Internet Self-Service – Enables employees to manage their own requests for job bids, preferences, training, off time, FMLA, vacations, and much more. Also displays absence history and other reports. Absence Tracking – Manages absence events and safety violations. Disciplinary Letters – Generates disciplinary letters based on your policies. Job Bidding – Automates job bidding, posting open jobs, and employee bids. Includes email messaging. Linked to training scheduling. Staffing Rotations – Models and tracks multiple shift and crew staffing patterns, including rotations. Batch Sign Off – Enables managers to sign off for multiple conditions for groups of employees. Deadlines – Manages and enforces user-configured dates and times for a variety of request deadlines. Employee Quotas – Enables automated granting of employee requests. Reports – Provides a comprehensive library of reports and powerful reporting tools. Utilities – Provides security, authentication, access and user control. Data exchange with production scheduling, ERP, HRIS, T and A, payroll, and Interactive Voice Recognition. "Even those who are not experienced on computers find this system easy."